Amomum villosum (Zingiberaceae) grows as a perennial herb in Yunnan and Guangdong provinces in China. Xishuangbanna in Yunnan Province is the main production area, accounting for 60-70% of the total yield. The amomum fruit, a type of cardamom, is used as a spice in Asian cuisines and as herbal medicine to treat stomach ache and dysentery in humans. 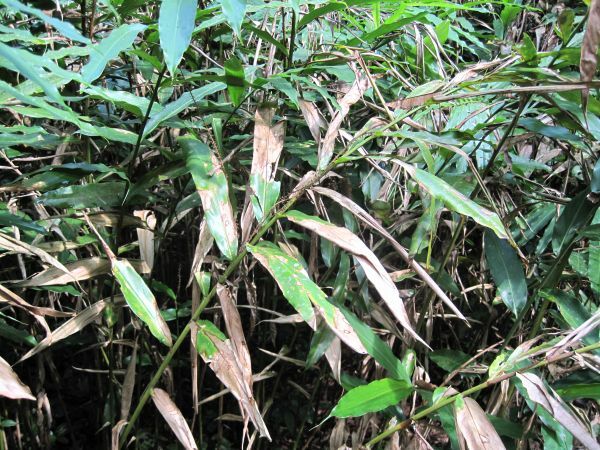 From 2004 to 2008, a leaf lesion was observed in 70% of the cultivated fields in Xishuangbanna. The incidence rate ranged from 10-46%, resulting in approximately 50% yield loss of fruit production. The lesions were round and primarily yellowish, gradually enlarging with a gray-white centre and dark brown margins (Fig. 1). Adjacent spots often coalesced, covering the entire leaf (Fig. 2). Microscopic observations showed geniculate, brownish conidiophores, approximately 260 x 3-5 µm with obpyriform, protuberant, 2-septate conidia, 22.5-37.5 x 7.5-10 µm in size. A DNA sequence analysis of the ITS region of a collected isolate (GenBank Accession No. GQ340561) revealed 98% identity with homologous sequences of Pyricularia costina Sarbajna (AY265327 and AY265328) (Bussaban et al., 2005). Based upon morphological characteristics and sequence analysis the causal agent was identified as Pyricularia costina. Pathogenicity tests were done using one-year-old potted A. villosum seedlings. Leaves were inoculated with plugs of mycelia taken from the margin of an actively growing colony on potato dextrose agar. The inoculated leaves were sealed with plastic bags to maintain high relative humidity and placed outside under shade trees, temperature ranging from 23.3 to 32.5°C (average 26.3°C) and an average daily rainfall of 3 mm. After 10 days, all mycelium-inoculated plants developed symptoms whereas control plants remained healthy. The same fungus was re-isolated from the inoculated leaf lesions. Pyricularia costina has been recorded as a leaf spot pathogen on other Zingiberaceae host plants, such as Costus speciosus in West Bengal, India (Sarbajna, 1990). Additionally, P. costina was isolated as an endophyte from leaves of Amomum siamense and Alpinia malaccensis in Thailand (Bussaban et al. 2003). 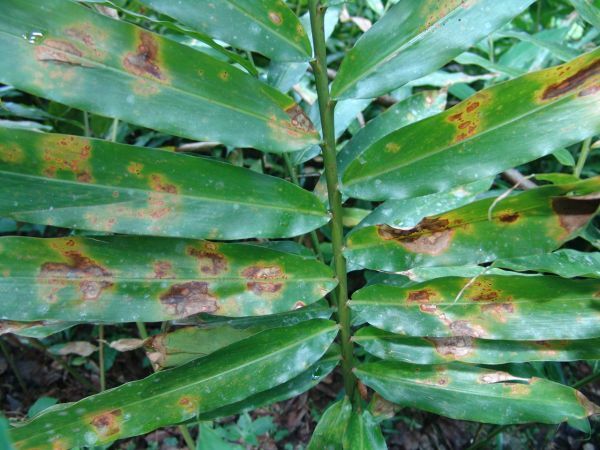 This is the first report of P. costina causing a leaf lesion on A. villosum in China. This research was supported by the National Key Technology R&D Program (2006BAI09B03) and Yunnan province Jinghong Science and Technology Project (2008-14). Sarbajna KK, 1990. New species of Mycovellosiella and Pyricularia from West Bengal. Journal of Mycopathological Research 28, 159-164.